Are you a bit overweight or obese and tired of it? Are you searching the web for ways to lose weight fast? Are you looking for a low cost, cheap or even free way to weight fast and safe? W8MD’s 8 things For Fast Weight Loss In New York City! While some of these questions can be kind of like an oxymoron – like wanting to lose weight quickly, but want no risks, there are things you can do minimize or eliminate most of the risk, lose weight fast, safe and using scientifically proven methods! So, what is the secret of losing weight fast? While there is no secret, here are 8 things you need to be aware of for fast and safe weight loss. 1. Do not look for fad diets of quick fixes for weight loss. If a program is promising to you can eat all you want but still lose weight, it probably is a “fad diet”. 2. Seek Professional Help for weight loss! With so much misinformation, you would need a doctor trained in Obesity Medicine to guide you in this, especially if you have any medical condition associated with weight such as high blood pressure, cholesterol problems, sleep apnea, prediabetes, metabolic syndrome, diabetes or other obesity related conditions. 3. No Fad Diets or Miracle Products for weight loss! If it is a product sold on the internet without evidence based, double blind studies to prove efficacy, it probably is some sort of “scheme”. In order to lose weight, you need to cut down the calories to a very low calorie (VLCD) or Low Calorie Level (LCD) which needs careful physician supervision in most cases. There are no miracle powders you can spray on food that can help you lose weight! 4. Look for a weight loss program that is affordable, willing to work with your insurance, and does not have obligations, setup fees, or mandatory products as your health insurance might cover for weight loss. Thanks to the Affordable Care Act of 2010, all insurances are now mandated to provide coverage for Obesity Screening and Treatment for all adults. 5. Should I try non-medical programs like weight watchers or Jenny Craig’s first? While most people seem to be under the impression that non-medical commercial weight loss programs are cheaper, think again. According to this report, average money spent on programs like Jenny Craig per pound of weight lost can be as high as 250.00 USD. Using a medical weight loss program that accepts insurance, you not only get the safety and security of a physician level care for safe and effective weight loss, but it can be very much cheaper to lose the weight! 6. Should I try low carbohydrate or low fat? While both approaches have some merits and disadvantages, low carbohydrate diets have been shown to have a better long term success rate, reduce the risk of insulin resistance or metabolic syndrome, and is considered by most obesity medicine experts as a superior plan for sustained and safe weight loss. Both approaches, however, might need careful medical supervision in most cases. 7. I know why I am gaining weight, I am not exercising! While exercise is important for maintenance of the weight, recent research shows it is pretty useless as a tool on its own for weight loss as reported on Time, and even bally’s fitness website has some information on this on their website. Read this article on the role of exercise for weight loss. 8. Some people can eat whatever they want and still lose weight. Why cannot I? While the metabolism is different for each person, in general, you do need to reduce the overall calories in order to lose weight. Each pound of fat has about 3500 calories. So, in order to lose one pound of weight a week, you can cut down your daily calorie consumption by about 500 a day. Use the free Daily Calorie Calculator App available on the main W8MD Website to determine your weight neutral calories. A number of factors such as your age, genes, medicines, and lifestyle habits may affect your weight. 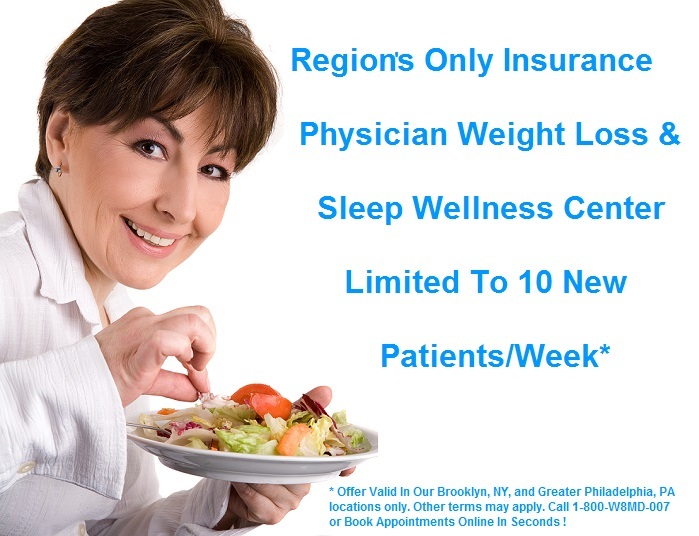 If you would like to lose weight, call W8MD’s unique insurance medical weight loss and wellness program today at 718-946-5500. Together, you may be able to create a plan to help you reach your weight and health goals. How can W8MD Medical Weight Loss Center’s Insurance Physician Weight Loss Program Help? Under the careful supervision of a fellowship trained obesity medicine physician and founder of W8MD, Dr. Prab R. Tumpati, MD, our insurance physician weight loss program in New York City is one of a kind program that can help you lose weight safely and effectively. We offer evidence based weight loss programs under medical supervision. Very Low Calorie Diet(VLCD) program for rapid weight loss from 800 calories and up.